Did you know Halloween is the biggest holiday for chocolate sales in the U.S.? Did you also know most mainstream chocolate comes from field where child labor has been documented? 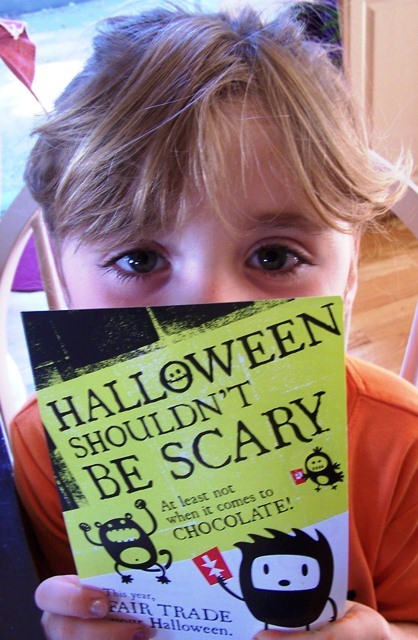 "Halloween shouldn't have to be scary" with Equal Exchange chocolates. 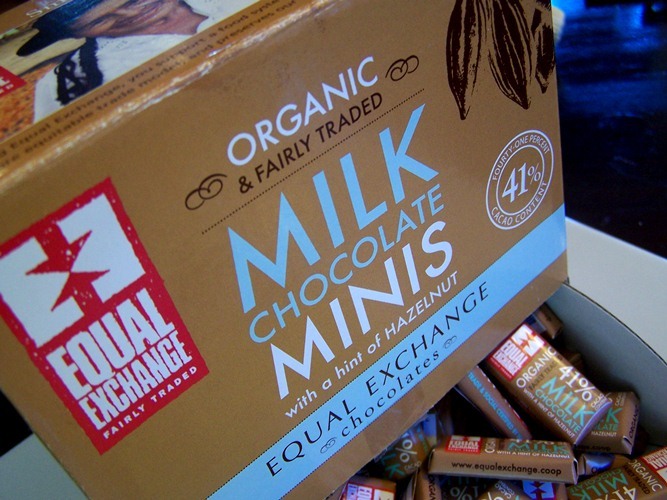 Equal Exchange has been a pioneer and U.S. market leader in Fair Trade since 1986 and is a full service provider of organic coffee, tea, chocolate, cocoa, olive oil and other products. 100% of Equal Exchange products are fairly traded, benefiting more than 40 small farmer co-operatives in 25 countries and around the world. Equal Exchange chocolate is sourced directly form the small farmer coops. These are the perfect chocolates for those of us (Me! me!) looking for a traditional candy bar flavor, but with high quality organic chocolate and you can feel good about eating them because they are Fair Trade! I recently had the opportunity to try Equal Exchange chocolate. 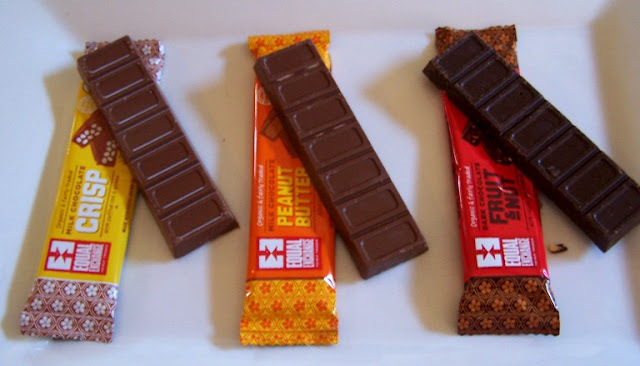 My family and I had a little taste test of the Peanut Butter, Crisp and Dark Chocolate with Fruit candy bars. Oh yeah...we loved them. My favorite (much to my surprise because I have always been a crisp girl was the dark chocolate with fruit. 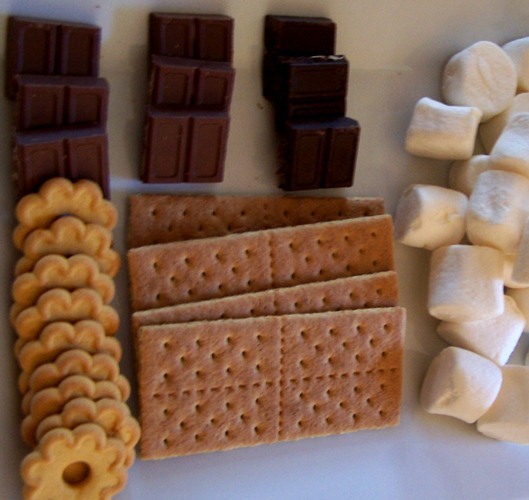 After sampling them on their own, we decide to many some fancy s'mores. Now, that could be slightly addictive! YUM! 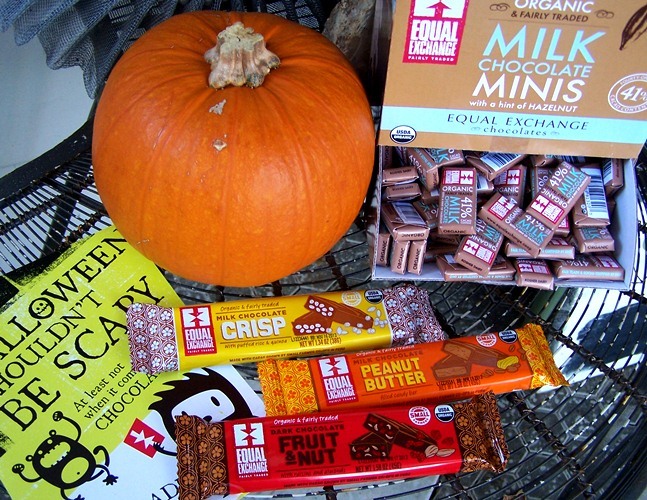 So, bring a little "fair trade fright" into your Halloween and support the small farmers in co-ops in Peru and Paraguay who produce the organic and fairly traded ingredients by purchasing Equal Exchange chocolates. 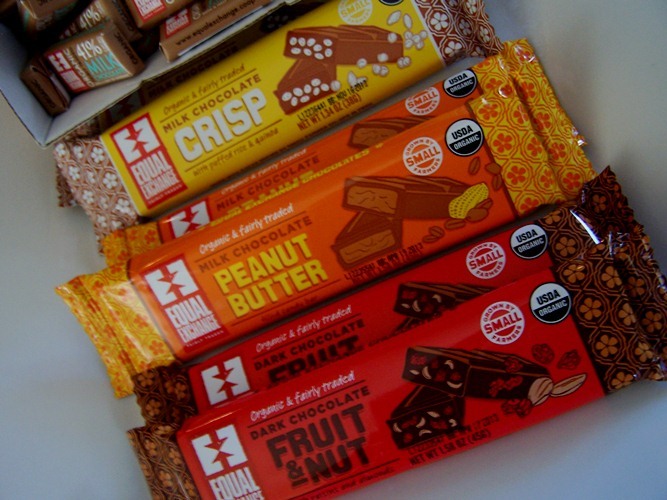 Hop on over the the Equal Exchange Facebook page (and give it a "Like") play the Cacao Game for a chance to win some candy bars. You will watch a farmer guide you through the harvesting of a cacao bean and even get a code to get 30% off a purchase! You can also win some chocolate right here...right now! and dark chocolate fruit and nut (with raisins and almonds). disclosure: I was provided with product to review and for this giveaway. As much as I love Dark Chocolate...I want to try the Peanut Butter one first! Thanks for the giveaway! Dark chocolate with fruit. Love that combo! Dark chocolate sounds yummy to me! You rang? Dark chocolate w/ anything has my name on it. OK chocolate w/ anything has my name on it. 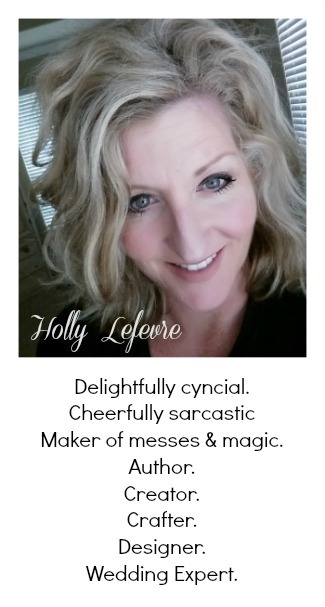 OK see my blog name. I have been reading all about the scary situation cocoa bean harvesters are put too. I have vowed not to buy certain chocolate this year. I am a sucker for chocolate so some fabulous Equal Exchange chocolate would be AWESOME!!! I like Equal Exchanges chocolates, but haven't tried the dark chocolate with fruit. I'm going to look for that next time I'm shopping! I certainly don't need any chocolate but the Milk Chocolate Crisp is calling my name!